As we have come to expect every year at Baselworld, Bell & Ross’ tinkering with its signature square-case aviator’s watch knows no boundaries. 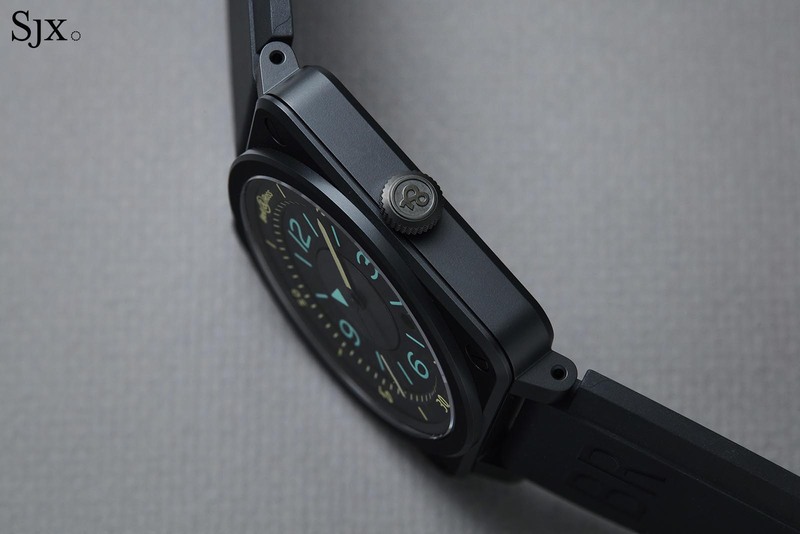 In the past three years alone, the brand has unveiled some fairly radical takes on the basic form, ranging from a dive watch to a flying tourbillon in a clear sapphire case. But it is the foundational BR 01-92 and BR 03-92 models – looking like instruments plucked from an aircraft control panel – that still form the bedrock of the brand. The best thing about the entry-level BR 03-92 watches is their no-nonsense aviation styling inspired by analogue aircraft instruments. 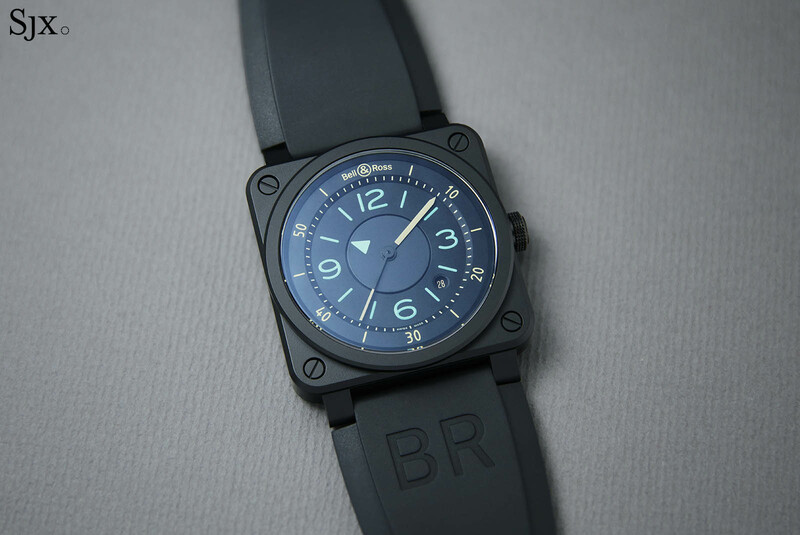 That’s exactly the new BR 03-92 Bi-Compass, which sticks to the usual ultra-legible styling but executed in a novel manner, with colours and geometric forms that inject industrial design into the military-inspired aesthetic. 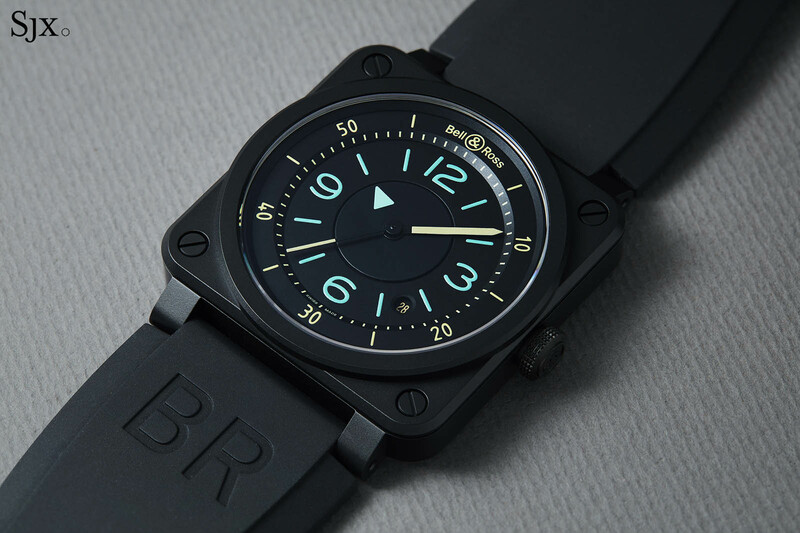 Rather than paying homage to a specific instrument, the dial of the BR 03-92 Bi-Compass is an amalgamation of analogue displays, centred on a rotating hour disc loosely inspired by a vintage radio compass. While most other BR 03-92 watches rely on just hour numerals at the quarters combined with hashmarks, the Bi-Compass takes it a step further with a new dial construction that separates the hour and minute graduations in both colour and depth. The Bi-Compass dial is divided into three concentric circles: an outer minute track with beige Super-Luminova markings every five minutes, an inner minute track that slopes downwards towards the hours, and then the hours in pale blue Super-Luminova. While the minutes are indicated by a conventional hand, hours are indicated by a blue triangle on a rotating hour disc. This separates the minutes from the hours – beige for minutes and seconds, blue for hours, improving readability. Naturally, the Super-Luminova markings glow differently in the dark, the beige of the minutes glow yellow, while the hours are blue. The hours disc is an ultra-thin wafer made of aluminium that’s light enough not to use excess energy from the mainspring, yet strong enough not to be deformed or cause any friction. 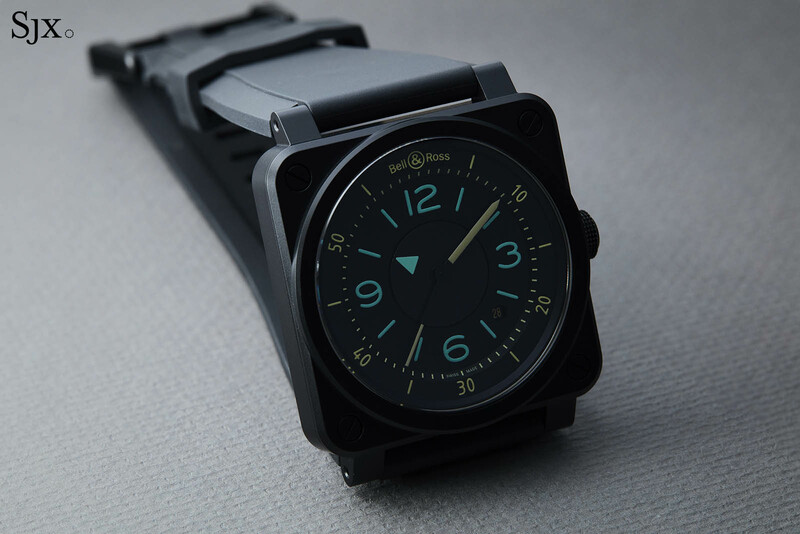 The watch case is 42mm by 42mm and smooth, matte black ceramic. 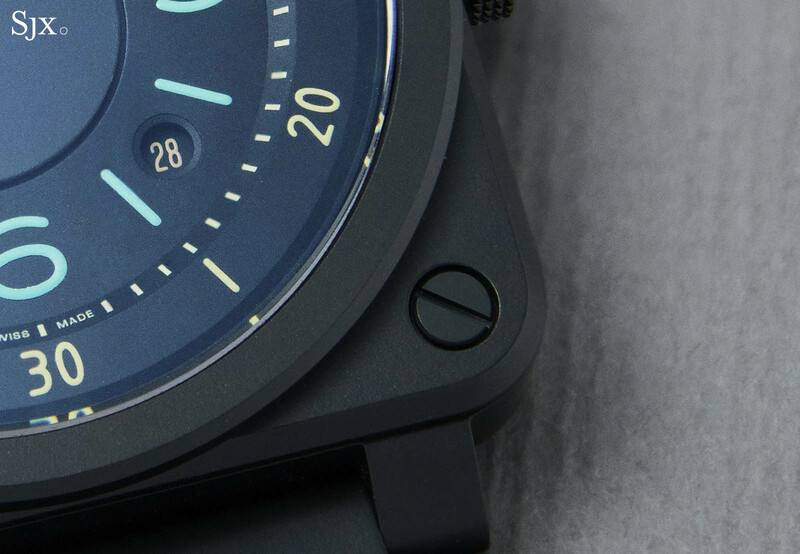 As with all BR 03-92 cases, the screws at the four corners of the bezel are perfectly aligned, with slots that point to the centre of the dial. That’s because they are actually nuts secured by actual screws on the case back; the screws span the height of the case and secure it together like a sandwich. Like most B&R cases, the ceramic case is produced by G&F Chatelain, a respected, specialist outfit that supplies exotic, high-end watchmakers like MB&F and Richard Mille. Inside is the BR-CAL.302, which is actually the basic but efficient Sellita SW300. A clone of the ETA 2892, it’s an automatic movement with a 42-hour power reserve. 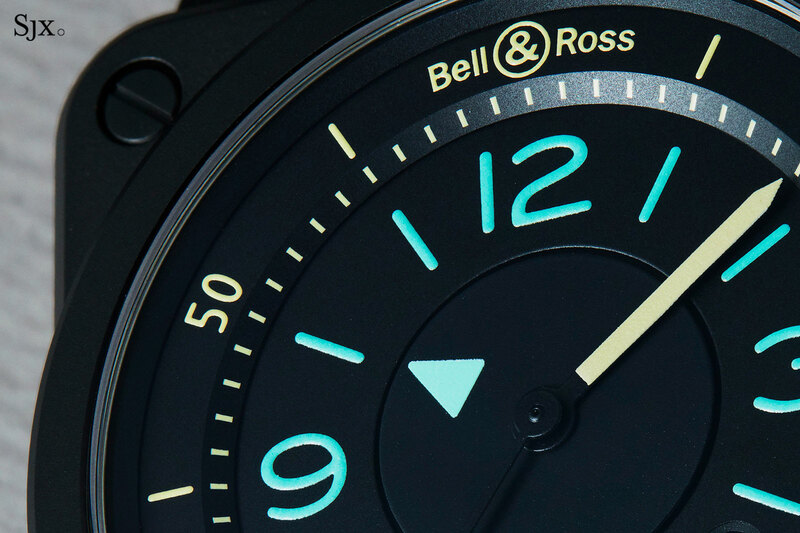 The Bell & Ross BR 03-92 Bi-Compass (ref. BR0392-IDC-CE/SRB) is limited to 999 pieces and is priced at US$3900, or 5700 Singapore dollars. It’ll be available starting April 2019. For more information, visit bellross.com. 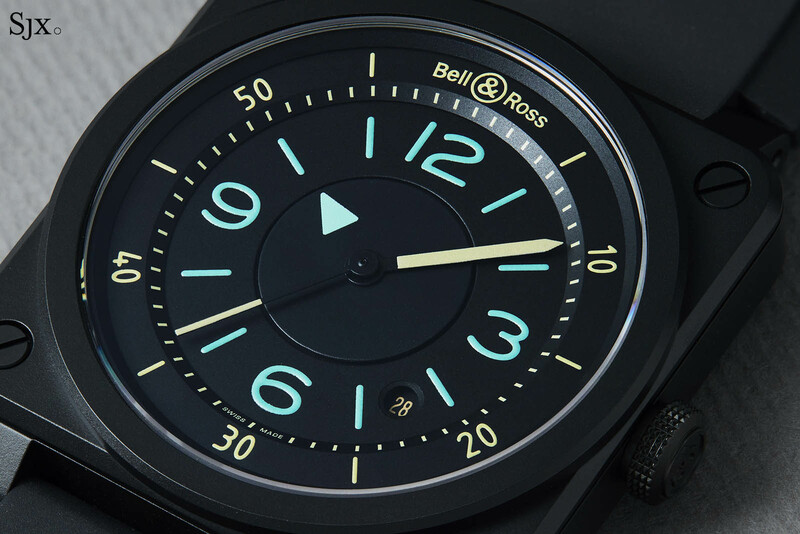 Bell & Ross Introduces the BR 03-92 Bronze Diver "Demiurgus"